Oh boy oh boy I wanna win this one! Have y'all heard of a company called Mixed Bag Designs? If not you are totally missing out! Mixed Bag Designs makes these "Eco Fabulous Reusable Bags"! Not only are they easy on our environment but they are oh so fun and trendy and super useful to top it all off! I have each of these two items below and I absolutely love them. The Department Store Bag is very durable and has tons of space for lots of goodies. We've used if for potlucks, the pool, the beach, and more. I was very surprised at the actual amount of weight this baby can carry. I'm telling you I love it! The Race Car Foodies are great for lunches. Don't you hate tossing out those plastic zipper bags? I sure do. No longer a problem! And what's more, beside being food safe these Foodies are dishwasher safe. Gotta love that! Mixed Bag Designs offer tons of stuff. Shopping Bags, Totes, Laptop Cases, Lunch Bags and more. They even have stuff for the guys! I truly do recommend their product! I first came across Mixed Bag Designs last year when we did a fundraiser for my son's school. Yep right at the end of the year we sold these fantastic bags and they were a hit! As a matter of fact I think we are actually getting ready to sell them again in about another week. That's how awesome our school did! Mixed Bag Designs does fundraisers and lots of them! They are a great alternative to traditional cookie dough and wrapping paper programs. And if any of YOU want more info, or would like to request a catalog, you can email DJ at dj@mixedbagdesigns.com. And if you wanna hop on over and make a purchase Mixed Bag Designs has offered free shipping for our readers! Just use coupon code caps at checkout. Free shipping good through 9/21. Mixed Bag Designs has generously offered up a fantastic giveaway! Three $75 gift certificates to Mixed Bag Designs online store! Oh yeah, 3 lucky winners will get to do some shopping and get a little something like so ↓! Visit Mixed Bag Designs then come back here and let us know what you might spend your $75 on if you're one of the lucky winners. This must be done before extra entries will count. • Like Mixed Bag Designs on Facebook and let them know you Love the giveaway @Cap Creations! Open to USA and Canada only. • Leave a separate comment on this post for each entry. • Make sure we have a way to contact you, should you win. • Last day to enter 9/15/11. • GOOD LUCK!!! Love these bags! I would love to win the gift cert & use it for gifts for friends so they can se how great they are! I'm already a follower of your blog thru Google Reader. Love these bags! Thanks for a chance to win. If I were the lucky winner, I'd get a head start on holiday shopping by picking the "hold everything bag", a couple of "hipster" bags, the "lazy 22 inch tote" & the "box and dept. store bags". Shew! I'm tired out from all that shopping. Thanks for a chance to win. the laundry basket or the travel bags. What a fun giveaway!!! I am already a fan of yours on FB. I would love a gift card to buy some department store bags and the red daisy laptop case and I would still have money to buy some more fabulous bags. Woot! What a great giveaway! I'd choose the Hold Anything bag or anything from the Travel line. Adorable! Hope I win! I really like the Hold Everything Bag, the Garment Bag, and the Duffle Bag. One of each would be super! I would love to have 3 hold everything bags and I'd get my husband a "manly" insulated lunch sak. I love the clip it's and the garment bags. I love the tall totes and the lunch holders. There is just so much!! I'm a cap creations follower on your blog! I love Cap Creations on FB. 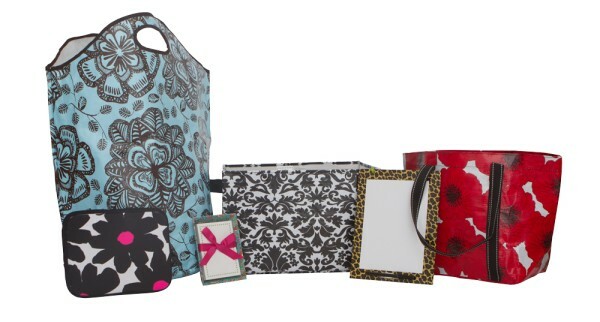 I would buy the Hold Everything bag in Damask! Thanks for the great giveawy! I'd buy the Hold Anything bags from mixed bag designs! Love them! I like Cap on Facebook. I love all theirbags but would probably get travel bags, these bags are so easy to wipe out of stuff gets spilled. I love the weekender totes and lunch bags too! I love the damask weekender zip tote. I would get a combo of things in prints of Blue/Brown Flower, Peace/Love and the Damask Everything Bag. Really cute designs! Weekender!!! 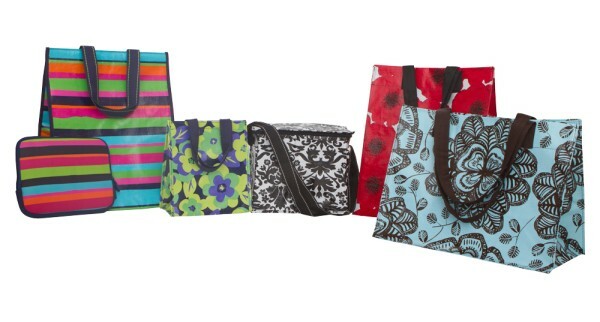 Box Store Bag...so many options...I love the black daisy design! I would spend my $75 on the grocery totes. They would make wonderful Christmas presents. I also love the large and medium totes and the box totes. i love the girls' pink leopard lunch tote-my daughter would love it! Wow! Everything is cute from the stationary to the storage to the large totes! I love the Damask Fold and Holds and the paisley bag is a must have too! I like mix bag designs on facebook. Love the shopping toetes and insulated totes! Laptop case and grocery bags...maybe...so many choices!!! I love the Hold Everything Bag, the Fold and Hold, and the Hipster. I don't know exactly what I would get but I'm sure it would be at least a couple of these. So many choices to choose from, I'd have a hard time choosing my order lol. However I know for sure the Pink Leopard Lunch bag (omg how cute!) And the Blossom Duffle Bag! I'm following the Cap Blog via GFC. I liked Cap on Facebook as Kelsey M.
I would love to have storage boxes and the store everything bags, both in damask! I love that print!! I "Like" Mixed Bag Designs and told them that I love the giveaway @ Cap Creations! I "Like" Cap on facebook! yourblog is socute, thanks for the giveaway. I love the iphone cases, fold and holds and grocery bags!!! I am going to order these for bridesmaid gifts! so cute! I would love to win some of them to cut the cost! I am a follower of the Mixed Bags blog! I love the grocery bags! I would use the gift cards to buy some Christmas gifts! i love the out of town set. i love your blog! i lovemkixed bags! I know one thing I'd order is the damask laptop case! I need luggage period....this is a great giveaway and love the color schemes. follow both blog, facebook w/ yes.4eva.r (@gmail(dot)com. If I won .... I would get the black swirl , black swirl large zip tote, red plaid duffle bag. red daisy 15"laptop case..
Neoprene 15" Case, and maybe one of the kids lunch bags. I liked the Mixed BAg Designs on FB and left a comment. Great giveaway! Would probably use for Christmas. Of course, I might have to get something for myself. I like Mixed Bag and commmented! I would get some insulated bags - Black Zebra is my favorite. Wish they had some things for men - my husband wants a cool lunch bag too! I like the damask shopping bag! I would buy that and the black zebra lunch bag. I followed you on facebook! Love your site and great ideas, I like the popcorn stickers. I commented about how great this givaway is on my Facebook page, "I just entered a great giveaway from cap creations." I would get one of the fun colored insulated bags for those days when I don't need a huge cooler but just a small one when I only have 1 kid with me. I like mixed bags on FB and left a comment!